It is not difficult to find family friendly restaurants in Las Vegas. These are the restaurants where the menu works for kids and the surroundings can cope with the sounds of a 3 year old. Not all of these restaurants are strictly for families instead they are locations where a family can have a meal and not be relegated to the loud, themed, kid joints. Las Vegas can be tricky for meal with the entire family simply because price points can get ridiculously out of whack. So, beware that sharing should be utilized as often as possible and make sure to ask if there is a kid menu. The Park Las Vegas just opened so you should be rejoicing because in that space between New York New York Hotel and Casino and Monte Carlo Resort there are so many options for cheap, family friendly restaurants that you won't have to consider many other places to feed the family. Heading north from the corner of Tropicana and and Las Vegas Blvd. you'll come to Tom's Urban at New York -New York Casino. This restaurant does small plates and can be co-opted as a family friendly location. The menu has plenty of small plates and is friendly to the young eaters. Parents will utilize this for a lunch option but avoid it during late night hours or during large sporting events. Next door is Shake Shack and their burgers and fries are affordable, family friendly and possibly the best fast food burger in Las Vegas. (yes, I said that, yes I have had In-N-Out burger). Head inside The Park Las Vegas and you'll be greeted with 3 good options for kid friendly meals. 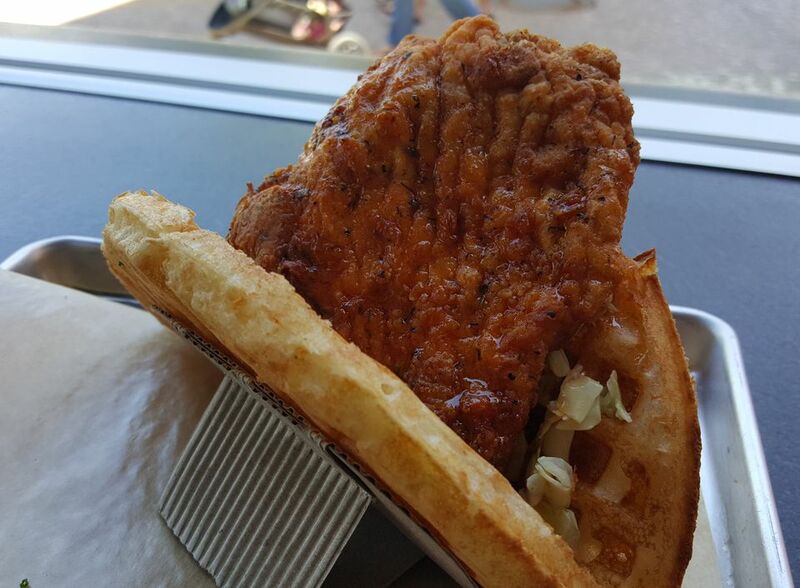 Bruxie does chicken and waffle sandwiches as well as pastrami and waffle sandwiches and pretty much anything else you can wrap in a waffle. This is a hit with families and the portions are shareable for the younger kids. California Pizza Kitchen is a chain restaurant but they have an only in Las Vegas menu that is very family friendly and quite impressive. The patio is adult friendly so have a drink and let the kids spread out just a few feet away in the common areas of the Park. Beerhaus is right on the edge of family friendly because it is set up for some really good beer drinking and raucous behavior, however, come in at lunch time and you'll be pleased with the large table games and the outdoor seating that allows the kids to have some snacks and the parent to have a few drinks. If you walk past the Park and over to Monte Carlo Resort Blvd. Creamery is good for the sweet teeth in the family but the price is 800 Degree Pizza and the best deal in town. Go in and create a pizza from their bases or just get a Marguerita and you'll be shocked at how good a pizza can be that will cost you less than $10. The taco bar outside can feed a family for a low price and a few entree's can work as well. Watch for the expensive quesadilla's. It's a deli, of course it works for kids, grab a large order of fries and have them split a sandwich. The menu is extensive and the portions are perfect for sharing which is always good news for families looking for a bargain. Margaritaville works for the entire family around lunchtime but as the evening creeps up so do the people looking to have a good time for a low price. Burgers and fries and all the regular good stuff that keeps kids happy. This is the place for breakfast, good selections and enough food so that the kids won't be hungry again until late in the afternoon. There is even a little light and water show in the back dining room. Pasta and Italian sandwiches are enough to keep the family from having to eat at the golden arches. Maggiano’s is located in the Fashion Show Mall and has a tremendous view of the North Las Vegas Strip and the Wynn Las Vegas. Large windows give this dining room an open, airy feeling and the setting is upscale and comfortable. However, the menu lends itself to being a family restaurant and the prices cannot be beat for larger groups. Family style dining and some really tasty food. The kids have to go to Spago, maybe a pizza or the mac n cheese or a simple pasta dish. It's on the expensive side for kids but the adults can have a real good meal. A good place for both adult meals and kids meals with plenty of outdoor seating just in case your kids get a little loud while eating. Where You’ll Be Doing In Las Vegas?